Jetstar Airways has apologised to a New Zealand passenger who was offended by being asked if she was pregnant. A flight attendant asked the question as Grethe Andersen, who was not pregnant, was boarding the flight on Sunday from Wellington to Auckland. Ms Andersen complained to the airline that the attendant showed "no remorse" in asking her the "rude question". Jetstar told local media it contacted her on Tuesday to apologise and offered her a NZ$100 ($67; £44) flight voucher. Like many airlines, Jetstar has a policy of requiring women who are more than 28 weeks pregnant to produce a doctor's note certifying they are fit to travel, for safety and liability reasons. Ms Andersen, 24, alleged the male attendant had gestured at his stomach and asked her: "How many weeks are you?" She said she did not get an apology at the time. Ms Andersen told New Zealand media she posted an account of her experience on Jetstar's Facebook account saying she felt "self-conscious", and added: "I used to be quite heavily overweight and even then was never met by such a rude question and especially no remorse from the flight attendant." Her post could no longer be found on the Australian-based airline's New Zealand or Australian Facebook pages as of Wednesday. 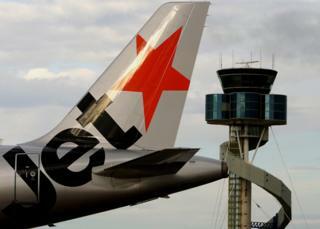 A Jetstar spokesman told news service NZME that it "sincerely apologises for the distress the passenger experienced".